If you love talking and you live for a fun, friendly atmosphere, you may be interested in a career as a bartender. Bartenders make substantial amounts of money in tips and cash, but the career path can be difficult to break into for beginners. Most bartenders will start as bar backs. Bar backs work behind the bar but only fulfill very simple drink orders. A bartender is an expert in the art called "mixology." Bartenders need to memorize many complex drinks and be able to serve them the right way. Cocktails can be exceptionally complex, with some containing up to a dozen ingredients. However, the responsibilities of a bartender will vary depending on their location. A bartender in a smaller bar may serve mostly straight liquor and bottled alcoholic drinks, while a bartender in an exceptional restaurant will find themselves mixing extremely complex drinks directly in front of his or her patrons. Bartenders shouldn’t be confused with bar backs. Bar backs are only allowed to serve certain types of liquor and are not allowed to mix any alcohol. Many bartenders develop a flair for their drink pouring and interact with their clients directly as a means to receive better tips. A bartender essentially takes a drink order and fills it, but in practice the task is more complicated than it may seem. There are hundreds if not thousands of drinks that clients may order and many have regional variations. Some of them require blending, grinding or additional types of mixing. Other more complex drinks will include layering or pouring in the right order. The bartender can consult a guide, but to do so often is considered unprofessional. Consequently, many bartenders need to have many drinks memorized. In smaller bars or restaurants, bartenders will often fulfill other duties such as keeping the bar well stocked and conducting inventory. A head bartender may be in charge of other bartenders or may be in charge of bar backs and may have to delegate work as is necessary. Essentially, a bartender is responsible for the workings of the bar and the satisfaction of those sitting at the bar. The bartender may also be called upon to fill drink orders for the dining area of a restaurant, and this may demand careful time management. How Do You Become a Bartender? Most bartenders will start as bar backs. Bar backs work behind the bar but only fulfill very simple drink orders. They cannot mix or pour alcohol, but they can serve drinks such as beer. 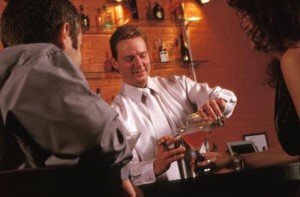 Becoming a bar back is an excellent way to get into a bartending career. Positions for bartenders are actually quite competitive, and the industry can be difficult to break into for a beginner. Those that want to become bartenders can also attend a bartending school. While bartending schools are not usually certified or accredited in any way, they do give bartenders valuable information about how bartending works and how to mix different types of drinks. Bartenders will also be given short term on the job training, according to the Bureau of Labor Statistics. How Do You Advance as a Bartender? Many bartenders have the eventual goal of moving on to become bar managers. A bar manager usually needs a form of degree in business before they can achieve a promotion, and work within the industry is absolutely essential for those that want to manage or even own a bar. Advancement within the field of bartending is usually dependent on getting better positions in better bars and restaurants. Higher end restaurants in major metropolitan areas can be extremely high paying for bartenders, as can upscale night clubs in areas such as New York and California. Senior bartenders usually get preferential shifts, which can make a tremendous difference in income. Bartenders can also move into related fields, which are listed by O*Net Online as retail salespersons, gaming change persons, gaming dealers and more.